The perfect way to ensure the safety of your home or business, an electric or manual driveway gate will give you the ultimate control over your security. If you are looking to secure the perimeter of your residential or commercial property, the first step you should consider is installing an iron or steel driveway gate. Combined with an intercom system and electric opener, these gates give you complete control over who enters and exits your home or business. These tough and durable gates act as a wonderful deterrent against burglars and trespassers, allowing you the peace of mind of knowing your loved ones and important assets are protected. If you already own a driveway gate, remember that it is equally important that it is regularly inspected and serviced by professionals. Driveway gate adjustment is necessary quite often, as the wear of daily use and the elements cause the system to warp out of position. Weak spots can appear in the metal of your gate, ones that are difficult to spot for the untrained eye. It is essential that all electric gates, intercoms, and automatic openers receive routine attention to ensure their perfect functioning. Remaining vigilant when it comes to maintenance is important in ensuring the security of your property. If you are looking to install or troubleshoot your driveway gate, "Gate Repair Brea" is the natural choice. 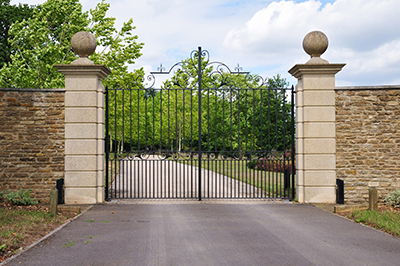 With unparalleled experience in all aspects in the process of installing and maintaining driveway gates, there is no more trusted name in the community. In addition, we pride ourselves on providing the best available customer service. We guarantee that your interactions with our staff will be courteous and professional. Arriving on time and getting the job done quickly is an important part of what we do. If you are looking at introducing a residential gate opener to your property, Gate Repair Brea has the expertise to install and maintain all of the top brands in the industry. Don't know where to start? Our team can guide you through the strengths of the various models and allow you to choose the best fit for your needs. Ramset gate openers are seen as one of the most durable and reliable automatic gate openers in the country. They offer swing, slide, and overhead systems that are secure and designed to endure over the long haul. With 23 years of excellence on the market, the award winning All-O-Matic gate openers are so secure that they are used to guard LAPD impound yards throughout Los Angeles. These gate operators are among the most trusted and consistent units available. And this is just a taste! There is so much more to learn in this industry, and we are here to help you with that! Call us today to schedule a service appointment or installation!